^ Red Sox owners through history. ^ MLB文档. MLB Attendance Report - 2008. espn. 2008-11-01 [2008-11-02]. ^ Red Sox's sellout streak ends. ESPN BOSTON. 2013-04-11. ^ Bill Nowlin. The Boston Pilgrims Never Existed. 华盛顿邮报. ^ The Boston Pilgrims Did Exist. ^ Boston Red Sox News. ^ Baseball-Reference.com. Cy Young Statistics - Baseball-Reference.com. [2008-02-17]. ^ Baseball-Reference.com. Dutch Leonard Statistics - Baseball-Reference.com. [2008-02-17]. ^ Year-by-Year League Leaders & Records for Home Runs - Baseball-Reference.com. ^ Stout, Glenn. A 'Curse' born of hate. ESPN. 2004-10-03 [2007-02-07]. ^ New York Baseball Teams - NY Daily News. ^ Yankees vs. Red Sox: Baseball's Greatest Rivalry. BaseballLibrary.com. ^ Yankees vs. Red Sox: greatest rivalry in sports. ^ Baseball-Reference.com. Carl Yastrzemski Statistics - Baseball-Reference.com. [2008-02-17]. ^ Rookie of the Year Awards & Rolaids Relief Award Winners - Baseball-Reference.com. ^ 23.0 23.1 Most Valuable Player MVP Awards & Cy Young Awards Winners. Baseball-Reference.com. ^ Baseball-Reference.com. Roger Clemens Statistics - Baseball-Reference.com. [2008-02-17]. 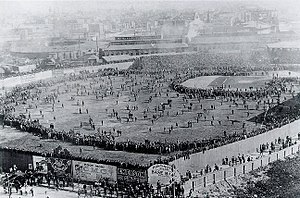 ^ The Official Site of The Boston Red Sox: Ballpark: Fenway Facts. ^ David Eckstein Statistics - Baseball-Reference.com. ^ Wrist still giving Big Papi some trouble. MLB.com. 2008-09-07 [2008-11-05]. ^ Going, going, gone. Boston.com. 2008-08-01 [2008-11-05]. ^ 美联社. Drew's game-winning hit keeps Red Sox alive in ALCS. ESPN. 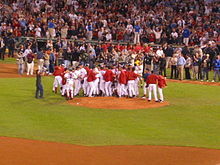 2008-10-16 [2008-10-17]. ^ Down by 7-0, Red Sox Force a Game 6. 纽约时报. [2008-10-17]. ^ Ian Browne. Red Sox unveil 'retro roadies'. MLB.com. 2008-12-11 [2008-12-15]. ^ County targets 2012 for Red Sox project by Glenn Miller, Fort Myers News-Press. [2008-07-14]. （原始内容存档于2012-09-06）. ^ Lee County commissioners approve Red Sox agreement. [2008-10-29]. （原始内容存档于2012-09-06）. ^ Red Sox home in Lee County will be on Daniels Parkway. [2009-05-01]. （原始内容存档于2012-09-05）. ^ Retired Numbers from redsox.com. ^ Buckley, Steve. Lofty position for Johnny Pesky. 波士顿先驱报. 2008-09-29. ^ Vega, Michael. Pesky makes honor roll. 波士顿环球报. 2008-09-24. ^ Grossman, Leigh. The Red Sox Fan Handbook. Swordsmith Books. 2001: 208. ISBN 1931013039.